Marriott International today unveiled a prototype that will help it build more green, LEED-certified hotels. The prototype is the first of its kind for the U.S. hotel industry, the company says. LEED, or Leadership in Energy and Environmental Design, is a voluntary rating system developed by the U.S. Green Building Council (USGBC). LEED-certified buildings are designed to meet environmental goals including reducing landfill waste and greenhouse gas emissions, conserving energy and water and lowering operating costs. 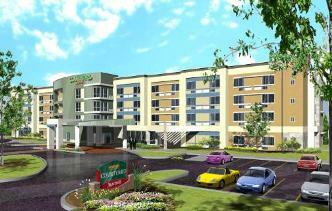 The Courtyard Charleston/Summerville is the first of Marriott hotels following the new, green design. It is expected to open for business in South Carolina in 2012. Using the prototype will save the hotel giant six months of design time on each hotel. That’s about what the company says it would usually take to design a LEED-certificate worth new property. Marriott plans to roll out similar prototypes for its other brands in the future, including Residence Inn by Marriott and Towne Place Suites. The company also expects to save about $100,000, and up to 25% in energy and water savings on each hotel built following this prototype. Going green is nothing new to Marriott. It currently owns close to 50 LEED-certified hotels and aims to raise that number to 300 by 2015. According to the USGBC, there are currently 937 LEED registered and certified hotels in the U.S. The environmental bug has hit the economy segment of the industry, too. A Motel 6 in Northlake, Texas became the country’s first LEED-certified motel property earlier this month. And Motel 6 is using a prototype approach to increase its number of LEED-certified motels as well.